What’s really interesting about this spot is the assertion that Iman Rauf believes “America was partially responsible for 9/11.” Obviously, the writers of this ad believe this view to be damning evidence of his terrorist sympathies. This mindset isn’t really contested in American culture: most citizens really do believe not only that the US’s foreign policy had no influence on al-Qaeda’s but that questioning this common knowledge is the equivalent to sympathizing with terrorists. This view is both intellectually cowardly and harmful to America- while Osama bin Laden is a completely evil man with no justification for his crimes attempting to understand and ultimately defeat radical Islamic terrorism without seeking to appreciate why his message has gained so many followers in the Arab world is foolhardy. Al-Qaeda’s message is at its heart a contradictory mix of rejection of modern values and populism. However, the popular narrative of anti-Western sentiment and Muslim nationalism that al-Qaeda’s extreme ideology grew from is both rational and understandable: many impoverished Muslims around the world have real reasons to hold a grudge against the West. Imagine yourself a young man in, say, Egypt. You’re probably unemployed, with little prospect for any education or a meaningful career. Because you don’t work you spend a lot of your time bored and isolated. There’s no prospect of political change in your country because the United States supports your autocratic president- he’s been in power for nearly thirty years and will soon pass the Presidency to his son. This dictator doesn’t tolerate any public criticism of his regime, but its obvious that your unemployment and your nation’s poverty is due to his misrule. You’re politically aware and spend a lot of time worrying about the plight of the Palestinians, who, after all, are suffering only a hundred miles away just over the border. You know Israel, and by extension America, are responsible for their suffering because the government controlled cable news stations constantly remind you. This suspicion of the US is compounded by the fact that America supports most of the authoritarian government in your region, stations troops for no obvious reason in your neighbor’s countries, and has spent decades making empty promises about coming change and prosperity. Is it any wonder that you, a young impoverished Arab man, could reject the values of your perceived oppressor and embrace the narrative of radical Islamism? This narrative gives you purpose and meaning: your beloved country isn’t responsible for its stagnation and your unfulfilling and static life isn’t meaningless. The worldview of radical Islamism is comforting because it is a flattering simplification of a troubling and complex reality- that’s why it’s popular. Of course the violence, nihilism and contradiction of militant Islamism repel many of these young men. But for others it isn’t a problem- it’s part of the allure. Arab and broader Muslim resentment towards the United States is by no means universal or homogenous. 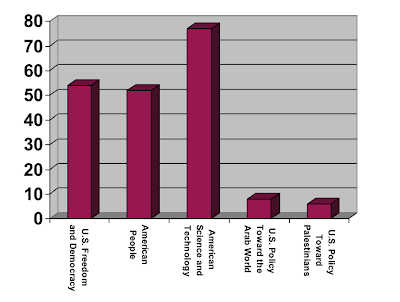 Most Arabs respect Americans and our achievements like democratic institutions, popular culture, and technological advancements. But our foreign policy is deeply unpopular in the region. We should understand that these views make sense and are very real- they’re simply human. While most Chileans respect Americans and the United States as a whole there is still deep resentment in some parts of Chilean society against the US government that overthrew a democratically elected leader and ushered in two decades of dictatorship and depression. It’s the same in the Muslim world: it’s hard to forgive the US when you know that American dollars are why you still have a president who acts like a king. The fact that American foreign policy decisions influence mainstream Arab anger against the US doesn’t excuse radicalism and violence for one second- al-Qaeda members are wrong and evil and should be hunted down. But if America can’t understand what motivates a man to join al-Qaeda or an insurgent group in Iraq we won’t be ever able to beat them. People make decisions for reasons, not in a political vacuum. Becoming a violent terrorist is an amazingly determined decision: a young man who decides to attempt to attack Americans is basically signing his death warrant. This isn’t a light decision, and he won’t make it without perceiving a long-held, convincing social cause that will justify his death. The war on terror is a war of ideas, not bombs- we will win when we convince potential terrorists that a multicultural world of political and religious acceptance and economic growth trumps xenophobia and blind radical nationalism. But the moment we forget that Arabs have very real grievances against their autocratic, stagnant governments and the US that enables them we begin to lose this fight. Automatically rejecting the idea that American policies can empower al-Qaeda by stoking resentment in the Muslim world is wrong. Americans need the intellectual honesty to try to understand the motivations of our enemies even if we don’t like the answers; its much easier to believe that the enemies who have hurt us are simply evil, barbaric men. Understanding doesn’t excuse their actions- this is a war we will win because we are right and they, the Islamist radicals who purposefully kill civilians to incite terror, whose blind nationalism makes compromise impossible, who keep women in oppression and slavery, are totally and irrevocable wrong. We can’t be afraid to understand the enemy; it’s never been possible to win a war otherwise. Americans who hold the cowardly view that our enemy’s actions have no motivation are worse than wrong- they’re foolish. Thank you. Really this is … the exact picture of what is happening. All that horrid/evil bin laden is doing is giving an aimless, poor kid a gun, and a purpose in life. Ruining a whole generation of promise. But what Americans really do need to understand is that they can put as many band aids on this problem as they want but that will solve nothing. It is the definition of a “festering” wound.